Republican Sen. Thad Cochran said Wednesday he thinks it's "kind of amateurish" that supporters of his primary opponent, Chris McDaniel, photographed his ailing wife in a nursing home and used her image in a political video against him. The six-term Mississippi incumbent said the motivation behind the video is beyond his understanding, and he's leaving the matter to investigators. McDaniel has denied knowing any involvement in the plot. 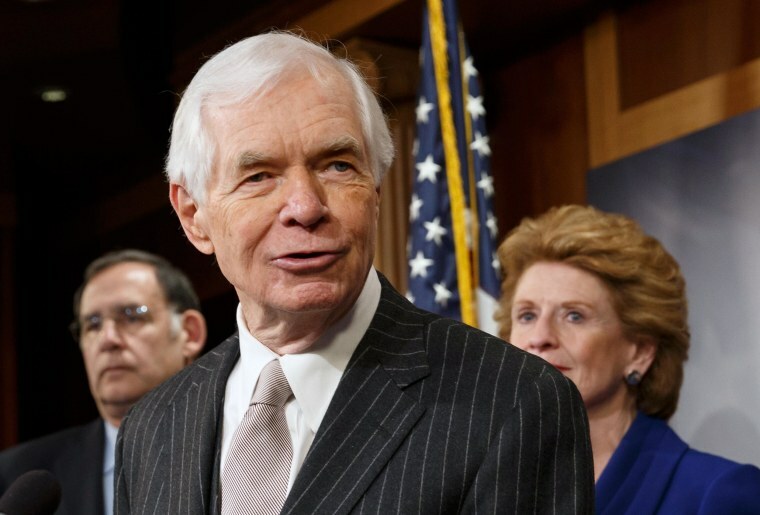 Still, it has overshadowed his tea party inspired challenge to Cochran in Tuesday's primary and sparked a multimillion-dollar ad war between the Republican contenders and their allies. "We, from the very beginning, simply said it should be turned over to the local officials for handling and we stayed out of it," Cochran said after a campaign event in Hattiesburg. Four men, including a conservative Mississippi blogger, face felony charges in what Madison, Mississippi, police call a conspiracy to exploit a vulnerable person. All are supporters of McDaniel. Rose Cochran has lived in a Madison nursing home for 13 years with dementia, has lost the ability to speak and is receiving hospice care, the family says. Police say Rose Cochran was photographed on Easter Sunday, and the video was posted briefly online six days later. An investigator has said Rose Cochran's photo appeared at the end of a video alleging that the senator was involved in an inappropriate relationship with another woman. Cochran campaign spokesman Jordan Russell has said any suggestion the senator is in such a relationship is "outrageous and offensive and the dirtiest form of politics." The Associated Press asked Cochran about the photo incident on Wednesday during a brief interview session with a small group of reporters after he spoke to about 75 supporters at a Hattiesburg campaign event. "It was kind of amateurish. I don't know quite any other way to describe it," Cochran said of the video. "And obviously, I don't know what, I assume, motivated through some private political interest that they thought could be derived from that. But that's beyond my understanding." His low-key reaction belies the high-dollar nature of the nomination fight. Detailed information about television ad buys showed a heavy concentration of commercials in the race, with slightly less than $4 million spent by Cochran or groups supporting him, and a little under $3 million by McDaniel and his allies. The information was gathered by media buyers and made available to the AP. Through May 14, Cochran had spent $3 million on his campaign McDaniel had spent just more than $1 million. Both men have benefited from outside spending that's expected to top $8 million. McDaniel said Wednesday that Sarah Palin, the 2008 Republican nominee for vice president, has made a radio ad endorsing him. Cochran's campaign said Wednesday that Republican former Sen. Trent Lott of Mississippi has made a radio ad backing Cochran.